And it’s pretty affordable too! Update (5 December, 2018) : We have just heard that the Vuze XR is now shipping to pre-orders and retailers. At Photokina 2018, HumanEyes Technologies have fully taken the wraps off their Vuze XR 360-degree camera, which is now available for pre-order. It has two modes for capturing immersive footage – 2D 360 and 3D 180, the latter of which is designed for VR experiences. Switching between the two is a quick, one-click process that simply involves opening and closing the camera. Resolution-wise, it can shoot at 5.7K 30p or 4K 60p. The Vuze XR Camera also can capture 18MP stills. When shooting 4K it can stitch its videos together in-camera, though for 5.7K footage you’ll need to finish the job on the computer using Vuze’s bespoke desktop editing software, available for Windows and Mac. There’s also a planned Vuze XR Mobile App that will feature stabilisation control, as well as remote camera control, preview options, editing, social media uploading and livestreaming on platforms like Facebook Live and Twitch. It will be able to create 360-degree panoramas, and will also offer the ability to add extra features like text, filters, stickers, effects, viewpoint adjustments and more. Interestingly, accessories for the Vuze XR camera include a 360-degree underwater case, which could see it as a potential challenger for the 360-degree GoPro Fusion. 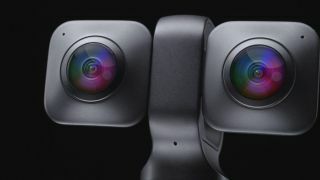 The Vuze XR Camera is available for pre-order now from VuzeXR.com, with a launch price of £399. For a limited time, this price will include an accessory bundle containing the 360-degree underwater case and a micro SD card, as well as free shipping. This offer only lasts until November 4 2018, so head to the website soon if you want to take advantage of it.